We also provide screen repair and re-screening. 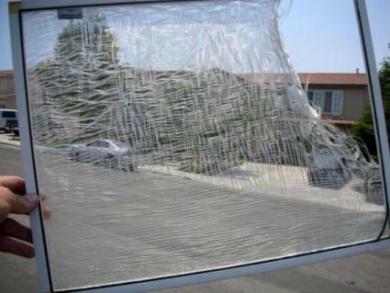 Did you know that aluminum screens can be ruining your windows? The picture on the right is an example of what aluminum screening can do to your windows.Please pay great attention to the before and after areas. The chalky look on the before side was caused by a aluminum screen. This type of screen is very common on Andersen windows that were installed anywhere from 8-30 years ago. Over time(normally 10-12 years) the aluminum screen will oxidize. 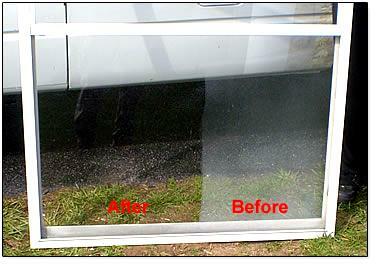 This oxidation process is natural,however it has a few adverse side effects on your windows. This stain in most occasions goes unnoticed because it’s hard to recognize the stain because the screens are on and most people just “assume” their windows are very dirty. If you have this problem we can help you restore your stained windows and convert the old screening over to the newer state of the art fiberglass screening. We have all sizes and colors to accommodate your needs. We even have pet screening and solar screening!! Your screen’s life span depends on many things and it would be silly to try to narrow one down. Most screens will last anywhere between 8-10 years, however some many last longer and others a bit less. This screen has seen it’s fair share of better days. Screen repair is relatively cheap compared to the cost of replacing and entire screen. The cost of repairing your screen is solely determined on the size, color,and type of screen your would prefer. Most replacements can be done for between $20-$35 and if your not a regular recurring client of ours yet we will even come and pick up and drop off the repaired screen(s) for an small additional fee. If you’re a fresh air person and open your windows and doors regularly to let the air in, we recommend closely inspecting your screens. 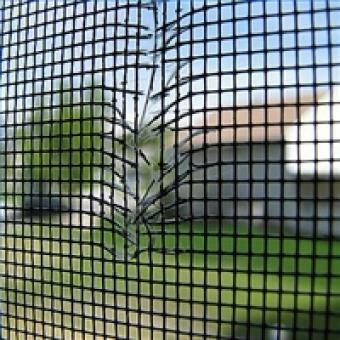 Damaged screens can allow bugs and other insects into your home. A hole about the size of a pencil is large enough to let those critters in. We can pick-up and drop off any screens that you need repaired. Replacing the screen and spline is a fraction of the cost of screen replacement. Call us today to get your screens fixed!! We will even come pick up your screens if you live in Baltimore, Lancaster, Harrisburg, Reading, Gettysburg or York.